Love lasagne but don't want to spend the time cooking pasta and assembling? 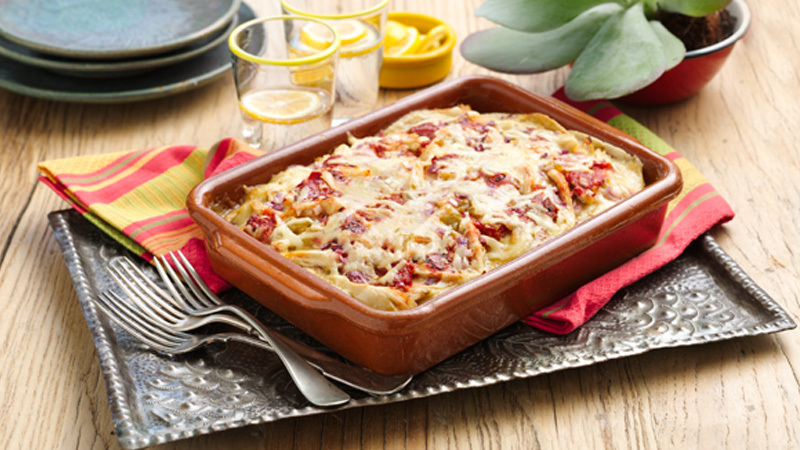 Try this twist on lasagne with a Mexican note; it will come together much quicker and be an even bigger hit with the family! 1. Preheat the oven to 190 ºC (170 ºC for fan assisted ovens), gas mark 5. Mist or grease a 20cm square baking dish 9 (about 2 litres) with cooking spray or oil. Spread 1/4 of the enchilada sauce in the bottom of the dish. 2. Arrange 4 tortillas in the bottom of the dish (tear and overlap as necessary, to completely cover bottom.) Top with a third of the chicken, tomatoes, red onion, green chillies and cheese. Spoon over a third of the remaining enchilada sauce. 3. Arrange 3 tortillas over the enchilada sauce (tear and overlap as necessary, to make new layer). Press down slightly. Repeat with all the remaining ingredients, making 2 more chicken layers and one more tortilla layer. Finish by scattering over the cheese. 4. Cook, uncovered, for 40 minutes, or until bubbling and heated through. Let stand for 10 minutes before serving. Great served with some soured cream, guacamole and fresh coriander. Make it meatless – use roasted root veg as an alternative to the chicken. Roasted butternut, peppers and courgettes would taste great.